Home Headlines Forbidden Lands a new RPG from the Makers of Tales from the Loop launches! Forbidden Lands a new RPG from the Makers of Tales from the Loop launches! Today we’re really pleased to announce the release of a brand new RPG, Forbidden Lands from the creators of the award-winning RPGs Tales from the Loop, Coriolis – The Third Horizon and Mutant: Year Zero. The new Forbidden Lands RPG went down a storm at last weekend’s Dragonmeet and this brand new releases comprises a Forbidden Lands core boxed set, the Raven’s Purge campaign, a GM Screen, a Dice Set and Card Deck, and all are available on Modiphius.net as part of our Forbidden Lands collection. Hardcover Player’s Manual with faux leather covers, including rules for fast character generation, visceral combat, lethal magic, dangerous journeys and for building your own stronghold – easily be ported to your own favorite game world. 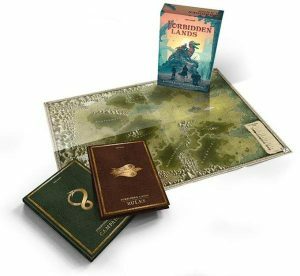 Hardcover Gamemaster’s Guide with faux leather covers, including a rich and detailed description of the Forbidden Lands setting, a large illustrated Bestiary, extensive random encounters, and three complete adventure sites. The Legends & Adventurers booklet, letting you flesh out your characters and give them unique backgrounds. A huge full-color map, giving you the freedom to explore the Forbidden Lands any way you want, hex by hex. A sheet with sticker for adventure sites and gravestones, transforming the game map to a living, permanent record of your adventures. These dice support the game mechanics of Forbidden Lands and include the custom symbols used in the game. The dice can also be used as normal dice for any game. We hope you’ll enjoy this brand new fantasy open-world survival RPG and look out for more great Forbidden Lands releases, coming soon!